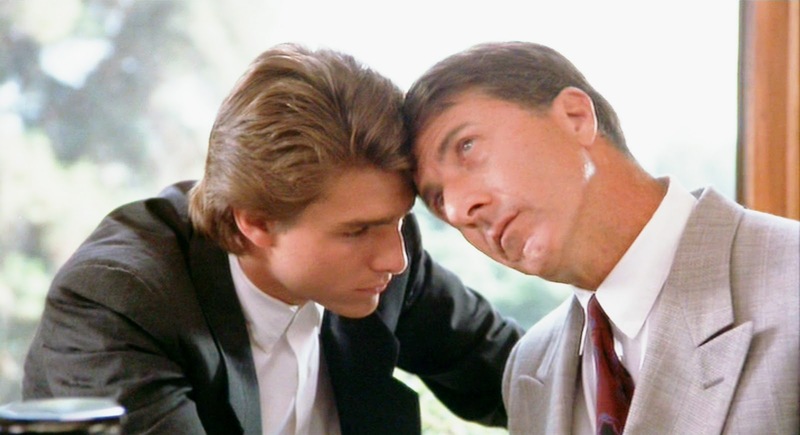 Rain Man is a film that has some very good aspects to it. 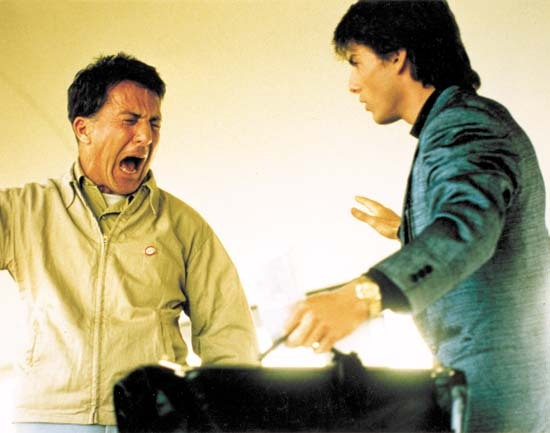 Mainly the acting with top-notch performances from its two leads Tom Cruise and Dustin Hoffman, the latter of which would win the Best Actor Academy Award for. People loved this movie and celebrated it immensely when it was released and is still well regarded today, unlike some other best picture winners (Dances with Wolves, The English Patient, Crash just to name a few). So how come I always despised this film? I saw it for the first time in eighth grade and heard how remarkable it was. I did not care for it much then but was too young to truly comprehend and articulate why I disliked this film. Years later I would revisit it and give it another chance since I recalled the acting being very good and it did feature two of the finest thespians at the top of their game. I would later find out that Stephen Spielberg would put this entire movie together in the pre-production phase but due to disputes over money was forced to leave by MGM and went on to direct Indiana Jones and the Last Crusade. 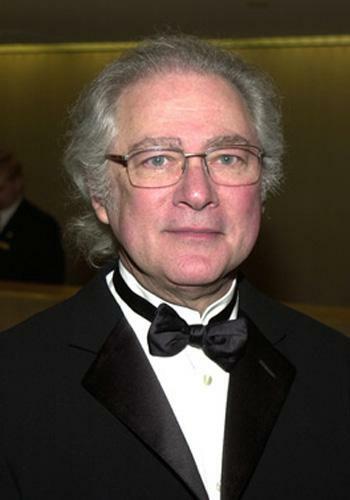 Now that might sound all well and good since he delivered a great third entry to the Indiana Jones series, but I am sure that it hurt him tremendously to see the man who replaced him (Barry Levinson) walk up the podium and accept the Best Director Oscar for a film that he practically put together. This was prior to Schindler’s List and Saving Private Ryan when Spielberg had never won a best director Academy Award. 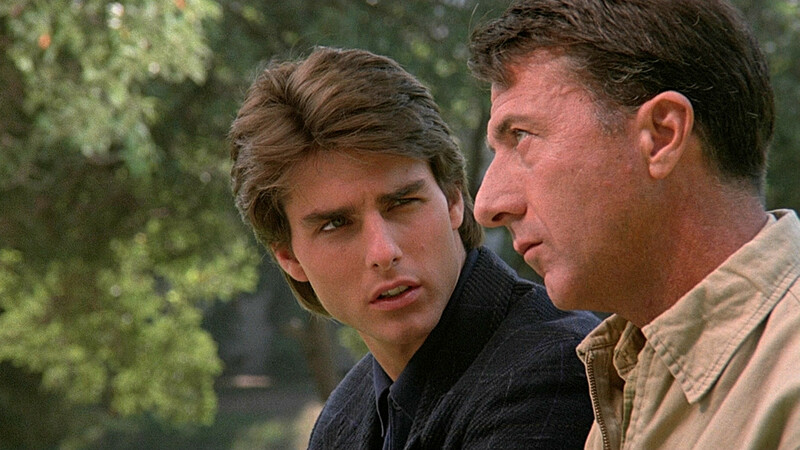 Regardless, that little bit of trivia was not why I disliked Rain Man. 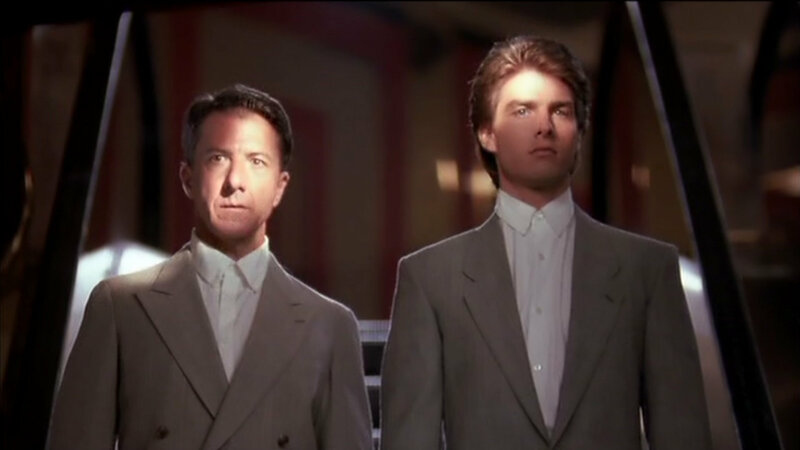 To me, Rain Man was a good movie for all of the wrong reasons. When it was over, all that I could think about was how I wanted to have my own little, goofy autistic brother. I wanted to take him to Las Vegas and do that whole card counting trick and win lots of money and a free hotel room that was way out of my price range. This was a Hollywood-machine Best Picture winner of the worst kind. It sent the wrong message and made autism look fun. I challenge you to find anyone who has someone in their immediate family afflicted with autism and ask them if they ever received any amazing benefits from parading around their autistic sibling or child. Obviously the answer will be a resounding “No!” In fact most families do not want to parade around their autistic loved ones, they have a difficult time taking them to even the most mundane public places. The fact that I even thought about how it made a form a mental retardation look “cool” and “fun” is the reason I loathe Rain Man. It failed to connect its message to me and instead left me feeling that it was glorifying autism. Also, back to the whole Oscar discussion I brought up earlier in the article. 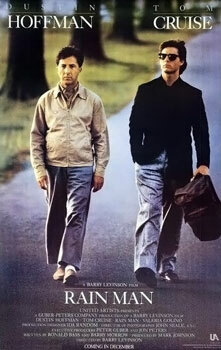 Rain Man would be the big winner at the Academy Awards that year with 4 Oscars including best picture. However it would be Dustin Hoffman’s Best Actor trophy that upsets and offends me the most. I do not mean any disrespect to Mr. Hoffman. He is undeniably one of the most talented actors in cinema and has been for nearly the past half century. He should have won Best Actor for The Graduate and deserved it when he won for Kramer vs. Kramer, but winning for this film was just insulting and playing into the cliché of if an actor plays a retarded character, they win an Oscar. Hoffman did a good job with the script and direction he was given. The fact that he came up with the ending we see in the film, and had to fight MGM to use that ending with Hoffman and Cruise not being happy together and instead see Hoffman’s character leaving on a train, makes me admire Dustin Hoffman and upsets me even more that this won best picture and Levinson earned best director. Can you believe that one of the best parts of the movie was from an actor’s great improvisational mind and not the screenplay or the director? The ending works so well because unlike the rest of the movie, it does not give its audience exactly what they are expecting. Thank you Dustin Hoffman. Shame on everyone else involved. Everyone that is, except for Tom Cruise. Yes, that’s right, I am about to defend and praise Tom Cruise. Say what you want about the world’s biggest scientologist and couch jumper, Cruise owned this movie. His performance is one to be savored and should go down in his filmography as a time the actor showed great restraint and held back allowing his co-star to chew the scenery and steal scene after scene from him. It is a smart and humble performance that is often overlooked because he appears to be playing himself while his onscreen brother is playing someone with a mental disability. On the surface playing a retarded character is much more difficult, but when you look deeper, Cruise delivers the stronger pivotal performance of the two. He is the one that is taking us on the journey of understanding Hoffman’s condition and makes the movie work. He goes from complete ignorance and jealousy of his brother due to his father’s will, to slowly learning and becoming compassionate that by the end we believe that he genuinely has bonded and loves his brother and will miss him. We beleive it so much, that the audience longs to see them together in the final shot. 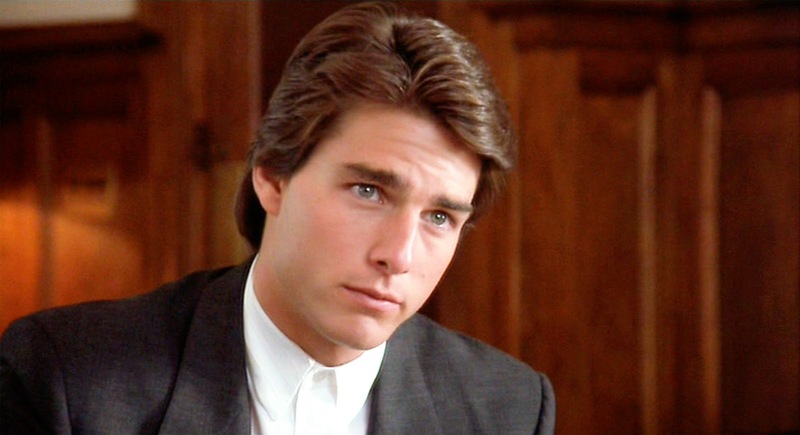 Tom Cruise should have been nominated or even won Best Actor for Rain Man not Hoffman. Cruise did not have the showier role but there is no doubt about it, he had the harder role and he handled it with a composure and maturity that he is seldom given credit for. 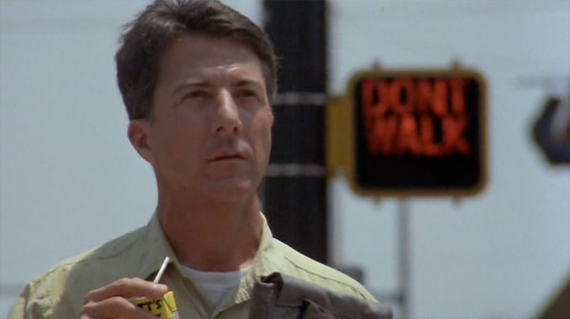 In the end, Rain Man failed for me because it ultimately sent the wrong message. Even watching it now I wish I could do what Hoffman’s character does in the film or at least have my own goofy retarded brother to take around with me and take advantage of. The fun scenes looked more joyful than the scenes that were meant to be sad and show the characters miserable time and daily struggles. That is a dangerous, misguided message to send. Anyone who knows somebody with a mental illness should find Rain Man downright offensive. If they made that, I would want to see that movie over Rain Man anytime. My dad used to quote that movie all the time…I saw it in theaters when it was released — when I was 6! I liked it, but was too young for it at the time. I saw it more recently, but still awhile ago. I’d have to watch it today to see if I agree with your viewpoint about its message. This movie came out just before I turned four years old. I recall seeing it very young and many times over the years. I’m diagnosed as having Asperger’s syndrome and have been for nearly 20 years now. I have to say that to this day it remains my favorite movie of all time and I watch it periodically and don’t feel insulted by it in the least. I guess the beauty of life is that we are all different and perceive things differently accordingly. Can you please not label autism “mental retardation”? That’s way more offensive than even anything portrayed in Rain Man, and that’s saying something. Duly noted. I am glad you agree that the movie is misguided.